When I first read about Unified communications, I was working for a company that had a Nortel phone system. The idea was simple: If you get a voicemail, listen via the email client. If you got a fax – same thing, you get it in email. At the time, the process was expensive to convert. However, nowadays it’s getting easier to have these options and utilize them for your Small to Medium Business (SMB). That is where a company like Alteva steps in. Creating a SMB solution for a business that doesn’t necessarily have an office. Giving you a way to conference at home and on the road. Alteva is one of many companies that are using Microsoft Communications Servers with SharePoint web services. By using this system, you can share documents and other items through the SharePoint web portal. This can be with clients, internally with other employees around the world or just for yourself. I have been working with this system for a couple months now. I got the Polycom SoundPoint IP 550 as the handset. Office 2010 with Microsoft Office Communicator 2007 SP2. I plugged the phone into the network, it ran through some setup configurations and within 10-15 minutes it was ready to use. I tested a few calls back and forth, everything worked pretty well. The installation of Office was a little more complex. Since I was installing Office 2010 64 bit on Windows 7 64 bit, I had to uninstall some 32 bit programs that I used. While it was a bit disappointing, it’s all about moving forward and those programs were not getting updated. Besides – I have other computers I can use with that software. The best part is not only I can use the handset to make calls, I can also use Office Communicator. 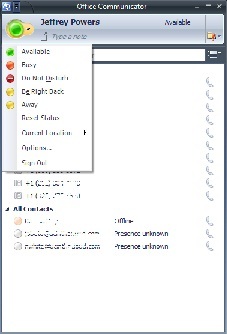 I have a USB headset that I use to make Skype calls, so I tried the same system using Office Communicator. Since internet phone calls on Communicator are usually 50 kbps, the sound is pretty much the same as a Skype call or Google Voice call. Communicator does have a video feature at 350 kbps. Within a week, I was able to put the phone into good use. 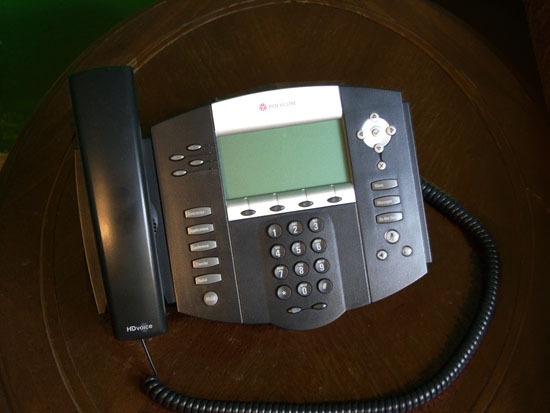 I made phone calls via Office Communicator and received calls via the Polycom unit. At first, the voicemail was not setup, but one email to Alteva and that problem was fixed. The setup was pretty straightforward. I had some post issues due to network connection issues. Otherwise I was able to set everything up within an hour. I am also not using the full potential of this unit just yet. There is a lot more to explore on this system. But I always say – It’s all about making a phone call. I could do that.